When H and I first decided to rent this lake house for the latter part of the Summer, I envisioned lots of homemade canning and icecream. While we have been cooking and grilling a lot, my time has also been spent knitting a blanket for the daughter in my belly and reading the new book by Jonathan Franzen. We’ve also been kayaking and exploring the outdoors. As much as I love the kitchen, I want to enjoy the beauty of nature before we return to the Concrete Jungle, aka NYC. 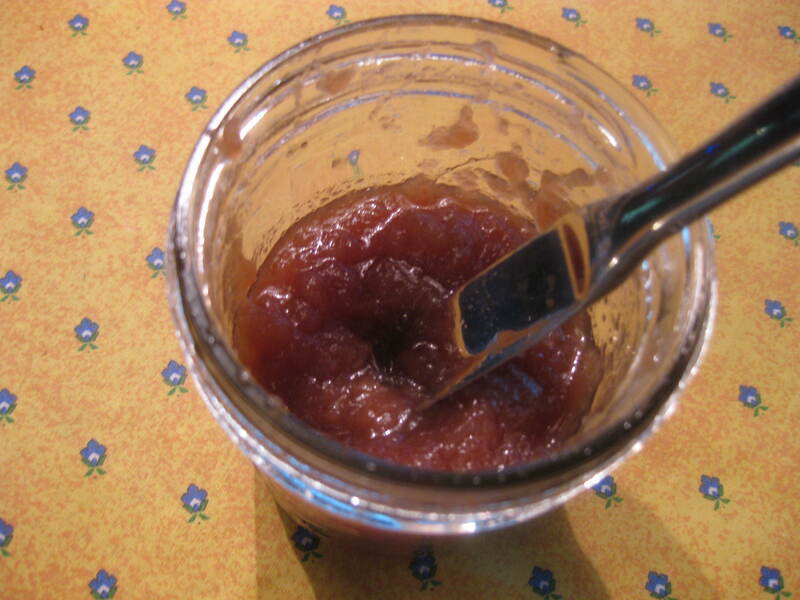 Yet on Sunday, while Irene brought lots of rain and wind into our enclave, I stood in front of the stove and made Heather’s homemade apple butter. As I approach motherhood, I have visions of my daughter and I making all kinds of homemade jams and spreads together. At the same time, I’d been intimidated by the process and postponed it for other, more easily seeming, options. Honestly? I don’t know why I waited so long. Making this butter was as easy as promised and tasted delicious. Few tools are required and nothing fancy is needed. 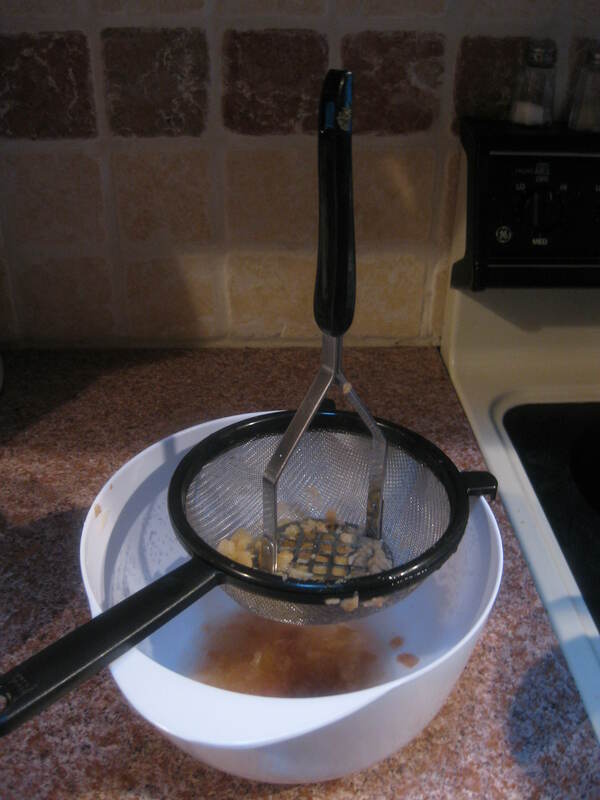 I spent about $7 on a fine mesh sieve and concocted this little contraption that worked quite lovely. Even while at a lake house that lacked wooden spoons, yet somehow managed to have a potato masher. 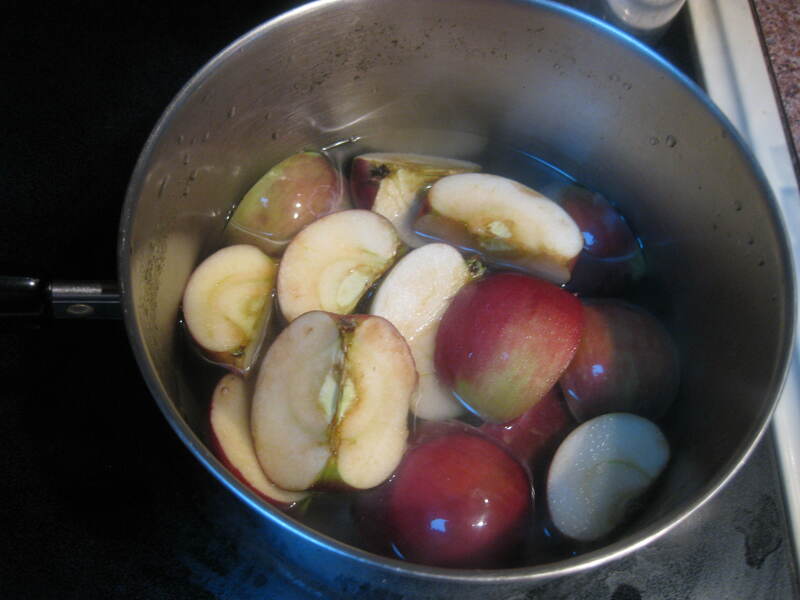 Another perk is that this recipe has lots of time in between steps – let the apples boil, the butter thicken – so you can do other things in between. Not much hard work is needed, yet a lovely apple butter is rewarded. For my first foray into home preserves, I am quite happy with the outcome. Especially good on homemade sourdough bread (more on that later) with a bit of regular butter as well. Enjoy! I was hesitant to use silicone in baking but the clerk made two very persuasive points. First, lots of cooking items are now being made with silicone. Not the strongest argument (didn’t we once use asbestos?) but she also remarked that baby bottles have silicone as well. I figured if it’s safe enough for our little ones, it’s safe enough for us. Second, since I’m not a professional baker, I won’t be using these pans every day. Every once in a while should be fine. I’m happy to report that they worked very well. 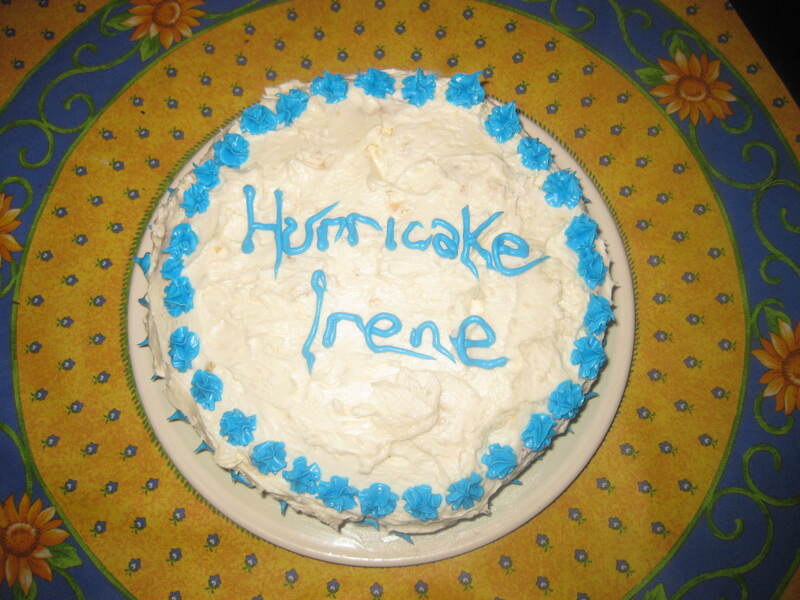 As I’m sure you know, the East Coast is prepping for a visit by a little lady named Irene. Though I baked and frosted the cake, H asked to decorate. How could I deny such a request? In response, he made a little joke. I can’t wait to dig-in! In the meantime, wherever you are, stay safe and enjoy! 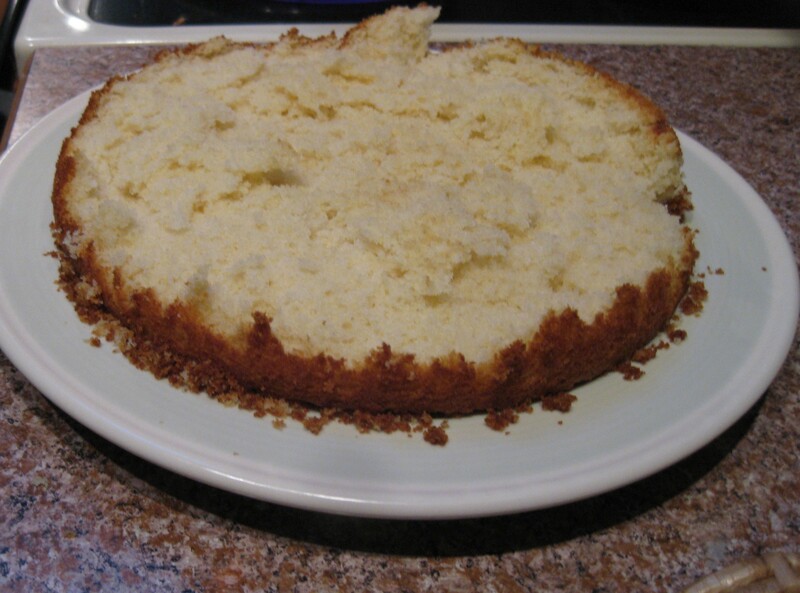 Remember last week when I had some baking issues? I thought I had failed to grease the pan properly so I tried again. Unfortunately, another fail. Then H stepped-in and suggested using double the butter and a different method. However we were left with the same result. 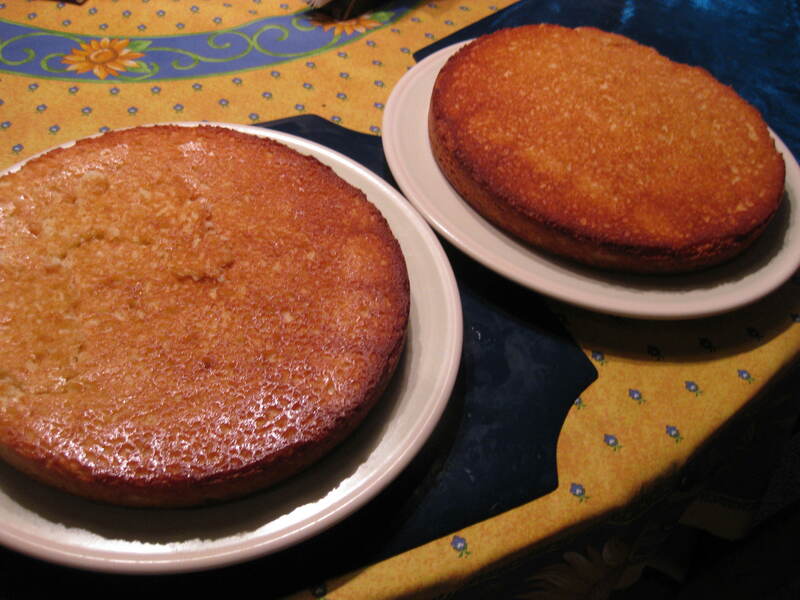 Half on the plate and half in the pan. It has since been decided that cheap pans were at fault. As a punishment, they met their destinies in the garbage can. My best friend and I therefore drove to the nearest store and bought a replacement cake. (We also saw a bear cross the road, which for two native NYers was quite scary and shocking. But that’s another story for another time.) In the meantime, I’ve learned my lesson. No more low-quality pans. Only the best for this kitchen. Or, at least a step above from Walmart-purchased worst. Enjoy!